Are you in your car or near a radio at 8:30 CST on Friday mornings? Tune to KBEM to hear me and Mr. Jones—Jazz 88 "Morning Show" host Ed Jones—talk about the week's jazz picks and more. 88.5 FM in the Twin Cities, streaming live on the Web. This weekend, it’s all about St. Paul. Or mostly. Confess: You’ve always wanted to know how to improvise. Or, at least, you’d like to know more about how improvisation works. Find out tonight at the Black Dog, when the Fantastic Merlins—saxophonist Nathan Hanson, bassist Brian Roessler, cellist Daniel Levin, drummer Pete Hennig—give a free masterclass. They’ll cover beginning techniques, improvising with an ensemble, and developing a personal voice. Piano, bass, and drums provided; if you play something else, bring it. Open to the public, to musicians of all ages and experience levels. The class will be followed by a concert at 8-ish. We rarely hear the Merlins play live in the Twin Cities for the simple reason that Levin is a New Yorker. I like this group very much, and their blend of jazz, improvisation, and chamber music. Their playing always makes me feel hopeful, and these days that’s an especially good thing. Listen to the Merlins here. Friday, 5:30 (masterclass), 8-ish (concert), Black Dog in St. Paul’s Lowertown. No cover, but please feed the tip jar. 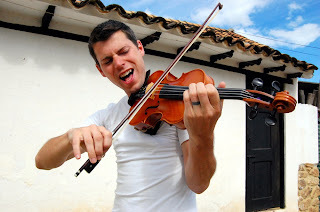 Kip Jones is a young violinist with a unique musical voice and background. Born in Duluth, he earned his degree in violin performance from Berklee in Boston, then hit the road: a nine-month motorcycle trip across North America, studies in Mumbai, a stint in rural South Korea, a year-long trip through South America. Combine talent with travel, curiosity, and intelligence and (if you’re lucky) you get Hallazgo, Jones’s new CD of original compositions, performed on solo violin and voice. “Hallazgo” is a Spanish word meaning “a find,” and it fits. Jones calls his music “traditional fiction” or “experimental folk”—traditional music from regions or people that don’t exist—and says it’s “stylistically indebted to J.S. Bach, the Delta Blues, and minimalist Steve Reich.” To my ears, it’s foreign and familiar at the same time, solid and truthful and deeply intriguing. The concert will have two parts: Jones solo, followed by Zations, his trio with accordionist Patrick Harison and bassist James Buckley. “Bulgaro-Macedonian improvisational stringy-accordion madness.” Bring it on. Check out "Burst Into Song, And," a track from Hallazgo. Friday, 8 p.m., Studio Z, Northwestern Building in St. Paul’s Lowertown. Look for the big red neon Z in the window. $5. A class act through and through. 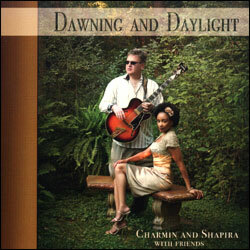 Lovely, elegant singer Charmin Michelle and virtuoso guitarist Joel Shapira, longtime collaborators on the Twin Cities music scene, have made their second CD together, after Pure Imagination (2005). Just out, Dawning and Daylight is what they do best: jazz standards and classics from the Great American Songbook. This will be a night of beautiful music, swinging and soulful, pitch-perfect and impeccably performed. Friday, 9 p.m., Artists’ Quarter in the basement of the Hamm Building, St. Paul. $10. 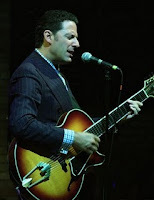 Hearing jazz guitarist and singer John Pizzarelli perform live is like having him show up in your living room. His concerts are warm, intimate, and relaxed—good music (Great American Songbook and beyond), performed with profound knowledge and real affection. If you’ve heard his syndicated radio show, Radio Deluxe, which airs every Saturday on KBEM from 4–6 p.m., you have a sense of what he’s like in person. Pizzarelli is especially fond of Nat “King” Cole, and his latest recording, Rockin’ in Rhythm, celebrates the music of Duke Ellington. You can’t go wrong. Here's Pizzarelli in a charming and playful performance of Dave Frishberg's "I'm Hip." Sunday and Monday, 7 p.m. and 9 p.m., Dakota, 1010 Nicollet Mall. $40/$25. Unless I'm mistaken, it’s been several years since multi-instrumentalist and five-time Grammy nominee Omar Sosa performed here. The last time I remember was 2002, when he played at the Walker with his septet—minus his vocalist, who couldn’t get a visa. Sosa returns this week with his Afreecanos Quartet to explore the music of the African diaspora, mixed with the sounds of modern jazz and the latest technology. Cutting-edge and traditional, folkloric and contemporary, global and personal, Sosa’s music is unlike anything else you’ll hear. Take a chance. The quartet includes Marque Gilmore on drum-and-bass, Childo Tomas on electric bass, and Peter Apfelbaum on saxophone. Sosa's latest CD is a solo piano album, Calma; we’ll probably hear some of that as well. His piano chops have been compared to those of Chick Corea and Chucho Valdes. Wednesday and Thursday, 7 p.m. and 9 p.m., Dakota, 1010 Nicollet Mall. $30/$20. Over at the Penumbra, Dennis Spears is starring in I Wish You Love, a new play by Dominic Taylor about Nat “King” Cole. After its world premiere performances here, it moves to the Kennedy Center. I bought tickets earlier this week and had a hard time finding a night when I could get two tickets together. Here’s Rohan Preston’s story from the Strib. Wednesday–Saturday (7:30 p.m.) and Sunday (2 p.m. and 7:30 p.m.) through May 22, Penumbra Theatre. $38. Check the live jazz calendar at the right or here for many more events. John Pizzarelli photo by John Whiting.